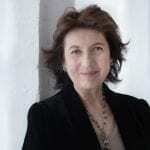 This Saturday, Imogen Cooper returns to Wigmore Hall to present a recital of works by Beethoven, Haydn, Julian Anderson and Liszt. Below, she offers her insight into the programme, including her unique connection to Julian Anderson’s She Hears. “This programme is one of three that I am performing [at Wigmore Hall] this season, all based on big Beethoven works as well as the three sets of Bagatelles, major Haydn sonatas, and a short contemporary/contemporary sounding work. It has been wonderful building into this structure some short and seemingly unrelated works – thus Julian Anderson’s poetic She Hears is followed without a break by Liszt’s equally atonal Bagatelle, known also as Mephisto Waltz No. 4. The shock of the massively tonal E-flat major chord that opens the following Beethoven Eroica Variations is as great as if it too were atonal. There is a strange continuity of keys too, not really calculated. In last December’s programme, there was a predominance of A-flat major/minor, to beautiful effect. In the last programme in the summer, there will be much C major, culminating in the great Diabelli Variations. This programme has a warm colour of E-flat major running through it. Imogen performs at Wigmore Hall on Saturday 17 March. More information can be found on the hall’s website. She then returns for her third Wigmore recital of the season on 26 June, with a programme of Beethoven, Haydn and Schoenberg.